You know what, though? I never liked E.T. all that much either as a kid, or as an adult, and I’m more inclined to draw comparisons between Earth to Echo and Spielberg’s Close Encounters of the Third Kind. Whatever its faults, this is a film about those rare parts of life where one is on the brink of something incredible, when discoveries are made rather than learned about second-hand. Roy Neary went off into the woods, while these kids go to the desert. Most real comparisons stop there, though, because this is a found-footage movie, and that in and of itself is one of the reasons why Earth to Echo isn’t a great movie for audiences of all ages. It is, however, a surprisingly good effort, as long as you’re willing and able to suspend your disbelief. A suburban neighborhood is being evacuated to make way for a freeway, which means best friends Tuck (Brian “Astro” Bradley), Alex (Teo Halm), and Munch (Reese Hartwig) are being forced to move away from one another. As they’re all approaching puberty, it’s a vulnerable time in their lives for such a massive change, and they want one last big group adventure, which Tuck plans to document for his YouTube page, where many of the guys’ other moments—none of which looked particularly interesting—are put out to the public. Luckily, fantastic things are afoot, and the boys’ phones begin transmitting odd signals that turn into a map. Because Earth to Echo is presented through videos, webcams, and alien-vision (along with Google Street View), we’re face to face with these boys for the entire movie, and the actors are under a lot of pressure to provide constant energy and reactions. They’re the “losers” of their school, the outcasts, but they aren’t endlessly hassled or anything; they’re just nobodies. For me, the standout was Hartwig’s Munch, a delightfully neurotic and meticulous chap who stands apart from the “weird friend” stereotypes. Because this is the attention-loving Tuck’s story, Bradley’s performance never drops below awkwardly hectic, and Alex’s backstory as a foster child means Halm puts his mopey face on a lot. So the question is, should these guys stay in and have a nice night at home, or lie to their parents and head out on a too-many-miles trek into the outside world for what could be the greatest night of their lives? They choose the latter, of course, and they’ve even got a pair of spy glasses to play with. This tool is used often, giving the film a different P.O.V. at times, but it never feels natural, and you can tell the only reason why they’re here is because there is no other way the film could justify the kids using a camcorder. That scene happens to include a construction worker who is part of a shadowy organization that is looking for the same thing the kids are: Echo. Echo is an alien living a rough life in the desert inside of a broken canister, whose communication skills are mimicked beeps and yes-or-no signals. That screenwriter Henry Gayden chose to avoid making Echo speak English was refreshing, even if it failed to create a character that is anything more than just a creepy-cute desk lamp that I want to buy. 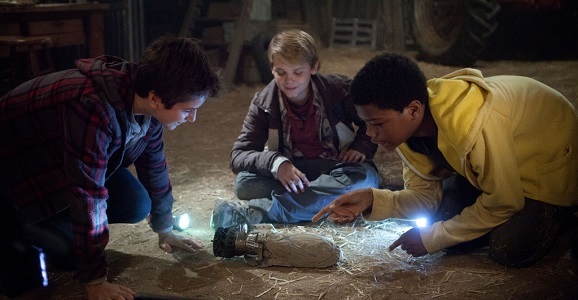 The trio learns what their new friend needs to do and they intend to help, along with Ella Wahlestedt’s Emma, the girl whom Tuck claims to have kissed earlier in the movie. Emma’s addition to the main plot is forced, but doesn’t damage the film in any way. The quest for Echo is something like a video game, as the kids bike from one location to the next, picking up different pieces of machinery. Therein lies the main problem with the plot. These kids travel seemingly hundreds of miles over the course of a few hours of darkness, helping Echo retrieve very specific parts, even though later in the movie, he’s able to just make any and all pieces of metal do whatever he wants. Also, the kids are followed by the most inept bunch of assholes this side of Fargo, and there are a dozen moments where the jig should have been up and their lives should have been over, but of course that didn’t happen. 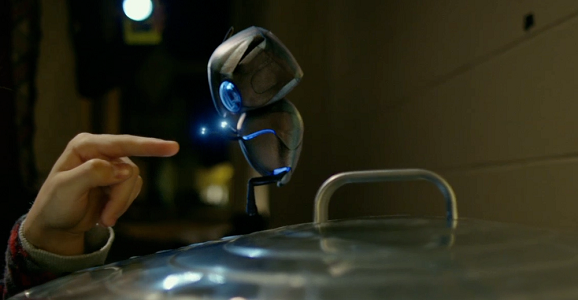 In the end, it’s fine, because it’s also a movie about a little metal robot who makes human friends, so I wasn’t expecting realism to ooze around all corners. Perhaps Earth to Echo‘s more ridiculous moments might have been more of an issue had the escalating tone not been so consistent, with kids who think they have nothing to lose putting everything they’ve got into a one-of-a-kind experience (while my thighs would have fallen off from all that bike riding). I expected heavy-handed dramatic beats with swelling orchestras (that have no place in a found-footage movie), but I didn’t think I would laugh as much as I did. Such an incredible situation provokes unparalleled behavior patterns, which leads to pure silliness at times. This is where Munch works best, with his ketchup-organizing and his mannequin fascination. I can see it all being even more effective for children that age and younger, especially the goofier moments. For instance, I stared agog at the second “metal thing ricocheting off of everything in a barn” scene I’ve seen in a movie this week, after Transformers: Age of Extinction. The filmmaking approach and technology hold pure nostalgia at bay, unfortunately, but Earth to Echo creates a sense of wonder that is the exception to mundane daily life. I wanted to be the funny kid in that group, zipping around town, talking to aliens, and making eyes at a cute blonde girl. This isn’t a film that needs to be compared to any Spielberg movies to deserve the same audience. This is family fun that works even if you’re alone in the theater without your family, laughing suspiciously louder than all the children around you.